There is news in the OpenSolaris front: new additions to OpenSolaris and formal naming of the new CoolThreads CPU from Oracle/Sun! OpenSolaris PSARC/2010/274 is not published, but appeared on Twitter describing a new "-xtarget value for UltraSPARC T3". For those of you who are unaware, the 16 core with 8 thread per core UltraSPARC T3 from Oracle appears to be the successor to the UltraSPARC T2+ from Sun. What does this mean for Network Management? 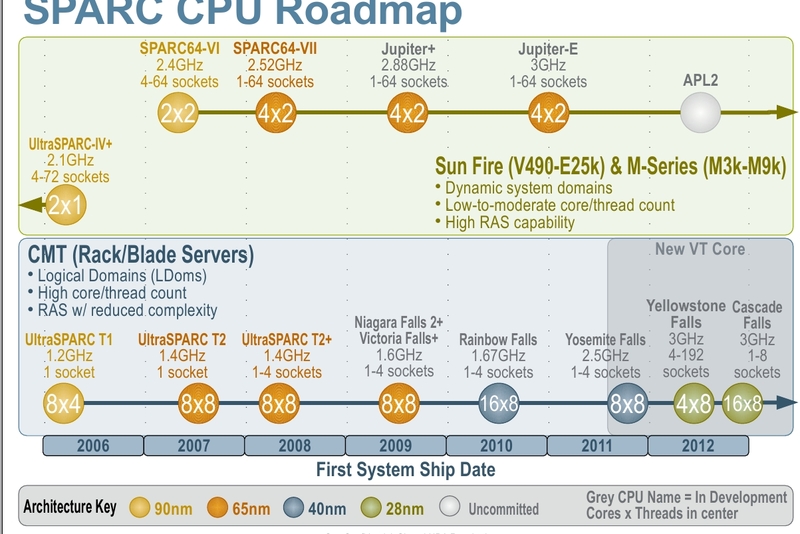 The Register published a possible SPARC roadmap, showing the a 16 core 8 thread/core processor showing up just after mid 2010, so one might suspect the arrival is close. Oracle OpenWorld starts September 20, 2010 - so we may have an announcement around then. If you are building or expanding a NOC, it might be prudent to as for an NDA to determine best purchase time or wait a couple months (if you are a new customer) before striking a purchase, since the high performance UltraSPARC T3 may be just around the corner. Twice the throughput per socket may be worth the wait, if the cost is not significantly higher. For years, users could not share NFS mounts from a Zone in Solaris. This may be about to change! With PSARC/2010/280, there is a chance that we will see the ability to share NFS from a Zone, but I can only hope that we will be able to see overlapping shares, so we can share those same Zones shared from a Global Zone, simultaneously. I hope we will be able to share the root zones via NFS from the global zone as well as directories separately from each individual zone. This is a great feature for hop-off servers. Yes, the DMZ implementations do matter. For 8 years, Sun has been re-developing the TCP/IP stack under Solaris. Nicolas Droux is involved as one of the core architects in Solaris in the process of re-architecting the TCP/IP stack. At the 23'rd Large Installation System Administration Conference (LISA-09), Nicolas presented over a short session describing the new features in Solaris TCP/IP from Project Crossbow. The desire is to allow the virtualized network stack to use as much of the hardware as possible. Allow the Virtual Machines to understand how much bandwidth they are allowed to use, to keep zones from stepping on one another. Management integrated into the stack itself, to avoid users having to look at multiple man pages. Hardware Lanes, to assign traffic to virtual NIC's, buffers, kernel threads, interrupts, the CPU threads, Zones, and/or Virtual Machines! Flows can be described by: Services, Transport, Port Number, etc. Properties can be attached to flows: Bandwidth, CPU, Priorities, etc. Bandwidth can be assigned to a NIC, Bandwidth Guarantees to allow bursting was on the roadmap in 2009. Political Posturing Holding Up Solaris, But Coming! Oracle is still working out, how Solaris/Solaris Next/OpenSolaris will play together. As I understood, this is the main reason why OpenSolaris 2010H? is delayed. New Solaris and/or SPARC releases on the way. My personal opinion is, that Oracle will invest more into (Open)Solaris than they will in Oracle Unbreakable Linux. In the former Oracle has full control, while the latter has to follow RHEL development closely. The biggest question at the moment is, will OpenSolaris 2010H? come out at all, and if yes, when... Honestly I don't know, but Oracle Open World could be a good time to release it. New Solaris Releases During OpenWorld? The question seems to be WHEN and HOW will the latest releases be conducted, not necessarily IF. Speculation seems to point around Oracle Open World 2010 in September. How this seems to it in could be tied into the various agenda items. Oracle and Fujitsu Keynote Addresses, for SPARC Solaris communities. Oracle and Intel Keynote Addresses, for Intel Solaris (and Linux & Microsoft) communities. While never attending an Oracle Open World in the past, one would certainly be interested attending the next one virtually! New UltraSPARC T3 Release During OpenWorld? What the SPARC community is waiting for, with much anticipation, is the arrival of UltraSPARC T3 processor. This processor will help the SPARC community jump ahead of the competition in the central processor community for the next few years again. The UltraSPARC T2, while still competitive from an aggregate socket performance perspective, is a little weak on cost competitiveness. With the doubling of cores on the T3, cost competitiveness should be increased.